Sad news is, there are some critters out there that are having the time of their life – the dreaded lawn insects and pests of turfgrasses and ornamentals. So the questions are, what do I look for? What do they do? and what do I do about them? You can easily find these lawn insects and pests if you were to check you or your neighbors lawn and landscape. 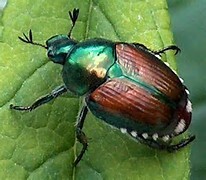 Japanese beetles start in the ground as larvae (also a turf destroying pest we’ll get to later.). Once soil temperatures begin to rise, the pests emerge and landscape plant destruction machines. Predicting their presence is a hard thing to do. Their numbers can go up or down due to the effects of weather, diseases, parasites and predators. They’re very mobile, capable of flying up to five miles in search of food. Unfortunately these pests have a vast palate as well, consuming over 300 different plant types. That being said, though, they do NOT phlox, peony, iris and daylily. There damage is pretty easy to identify. They skeletonize the leaves of plants, leaving only the veins behind. While the immediate damage doesn’t kill the plant, what it does do is decrease the plants ability to produce its own food. Photosynthesis begins with the leaf tissue taking in sunlight. 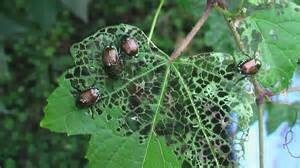 With the leaf tissue being removed by the beetle, photosynthesis cannot produce carbohydrates, thus starving the plant. Bad beetles, Bad! One of the most common mistakes I see people make when tackling Japanese Beetles is the use of bait traps. Bait traps use pheromones to attract the bugs and then relies on them to make their way into the trap. 95% of the time what actually happens is that the beetles invade your property in massive numbers. So how do you safely utilize traps? Put them in your neighbors yard! Or simply away from your own in the woods. Of course you can always call a department of agriculture licensed applicator to take care of the issue. 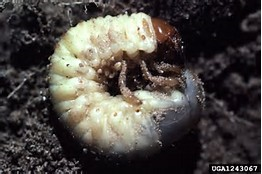 The grubs are beetle larvae. They’re most abundant in the spring and fall where they survive and thrive by feeding on the roots of turfgrasses and even landscape plants (such as hostas). Grubs are pretty easy to identify, as you can see in the picture. They’re about an inch long and are easily found in most gardens. As previously stated, grubs feed primarily on grass roots. They eat quickly and come in large numbers so it’s not uncommon to see them clear an entire lawn. It is important to eliminate them as soon as possible otherwise it can be a lingering problem always resulting in underperforming turf – poor color, poor density. You can use a host-specific product found at your local lawn and garden shop. Milky Spore is a host-specific pesticide that will work well on any lawn. It takes several years for it to build up in high numbers so it’s not an immediate fix to grub problems, but long term it can ward them off for many years. Army worms are a very common occurrence nowadays down south. It seems every year once the latter part of summer rolls around, so do the army worms. They are hairless, striped caterpillars that feed on the foliage or turfgrasses and crops. Called army worms for the way they travel in packs and invade in large numbers, they can do quite a bit of damage quickly. Army worms travel as moths. Evidence of moths can be seen early mornings and late afternoons and are usually attracted to light. There egg sacs can be spotted on brightly colored surfaces ranging from golf flags to home siding. They emerge from the sacs as small green caterpillars but mature into 1.5″ caterpillars ranging from olive green to dark gray. They don’t do well at over wintering so they usually migrate from further south. Army worms have many natural predators so there numbers vary greatly year to year. Often times there presence can be spotted because of the number of birds seen in a lawn pecking at them. Wasps tend to find them appetizing as well. There’s not much that can be done culturally to manage an army worm infestation. It can be handled a couple of different ways: 1. do nothing. 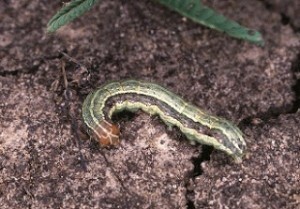 Army worms eat the foliage of the plant which doesn’t necessarily kill turfgrass. It can certainly stress it – no foliage means very little photosynthesis is taking place, but it doesn’t cause “permanent damage.” 2. Insect controls can be applied at relatively low rates to achieve an acceptable level of control. 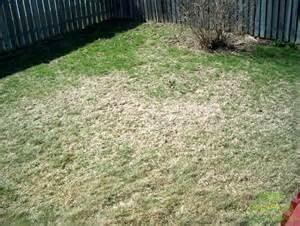 Once applied, with a little fertilizer, the turf can rebound back to its performance state. These are the three most common pests we see here in Knoxville. What pests have you come across? How do you handle them?